SUBSCRIBE PRINT EDITION NOW ! 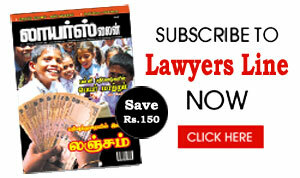 The Lawyers Line magazine is the leading Monthly Magazine comes with tamil language which delivers the voice of legal education. quality editorial, unrivalled for its breadth of coverage of the legal profession, every month. And it is written by a team of expert and highly experienced law professionals, journalists, including solicitors and barristers. It is distributed to the open public, the law professionals, solicitors, Governement Libraries through out the world. Your source for law school news, employment trends, rankings, helpful advice, inspirational stories and entertainment. Start your subscription today and let us help you make the most of your legal experience, and beyond.